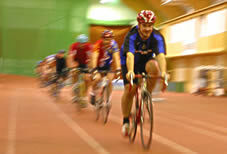 In winter, we ride indoors on spinning bikes equipped with gauges for Watt, Cadence and Pulse. In previous years we have also been housed in Friidrottens Hus, which we would like to resume. Nice and dosed running tracks. Here is the opportunity to work out on a roll, but also a great opportunity to practice interval training with distance raises. In principle, the same training policy applies indoors as well as outdoors, with some small adjustments. Helmet is mandatory for all cycling with the club. Always. Without exceptions. Every club has at least one training responsible. Always follow the instructions and instructions from them when attending club training. For safety reasons we do not run in larger groups than we are 6-7 cyclists in the group. Two groups can drive simultaneously on the track. Other cyclists are waiting next to the track. We are guests in the gym and are therefore expected to take care of us! Drinking during the cycling is not allowed. Run off the track and stop if you want to drink. Whatever you intend to do – make sure everyone finds out on time. Do not do any sudden movements laterally, but slide smoothly aside, preferably after you first mark with a small handwriting or the like. When it comes to brakes, you should preferably not use them at all when driving in a group. Possibly you should adjust the speed when it is really needed. If you need to brake a bit, go out slightly in the slope of the curve instead, then slide back into the roller again. In the case of indoor cycling, we always drive on a joint. No pair pairing in other words. There is really no reason to drive in pairs since the only wind we need to fight is the own speed. The courses in the indoor hall are not wide, but fully adequate if everyone follows these simple rules. Overtaking may only happen in lane 2. Driving if someone is driving is not allowed. Make sure that those you are about to drive are aware that you are coming. A clear “pass by” or the like usually suffices. Because the tracks we drive on are usually used for running training, it is assumed that the bikes we use are clean and the tires are dry. Wet decks also present a risk of cord in the curves. Make the overtaking as safe as possible. Always look back at the beginning and the end before starting a run-over and go from track 2 to 3. Be clear before leaving on track 3, at least 1 meter is available. Show with your hand. Talk to each other how to do. Here is a real pace. The distance must be kept. 1 meter from rear wheel to front wheel. At eventual exit. Show with your hand. Look forward, backwards that everything is ready. It’s ok to drive around those on track 4 but make sure they in track 4 are aware that the overtaking takes place. Rest, slow down, keep lower speed. Always keep a good watch. Make sure it is free back before returning to track 3. See you backwards and forwards before leaving and on the road. Show your hand clearly when you go on and on.